Comm Eye Health Vol. 18 No. 54 2005 pp 95. Published online 01 June 2005. Ophthalmologist, Vila Central Hospital, Port Vila, Vanuatu. Vanuatu, with a population of 200,000, situated north-east of Australia, is one of the many small tropical Pacific Island nations scattered across the huge Pacific Ocean. Vanuatu consists of a young chain of rugged mountainous volcanic islands, rising high out of the sea. There are five provincial hospitals in six provinces. With an annual growth rate of 3%, more than 80% of the population live in the rural areas scattered among the 83 volcanic islands. The life expectancy is 59 years for males, and 62 years for females. The major causes of blindness are cataract and corneal blindness mainly due to trauma. 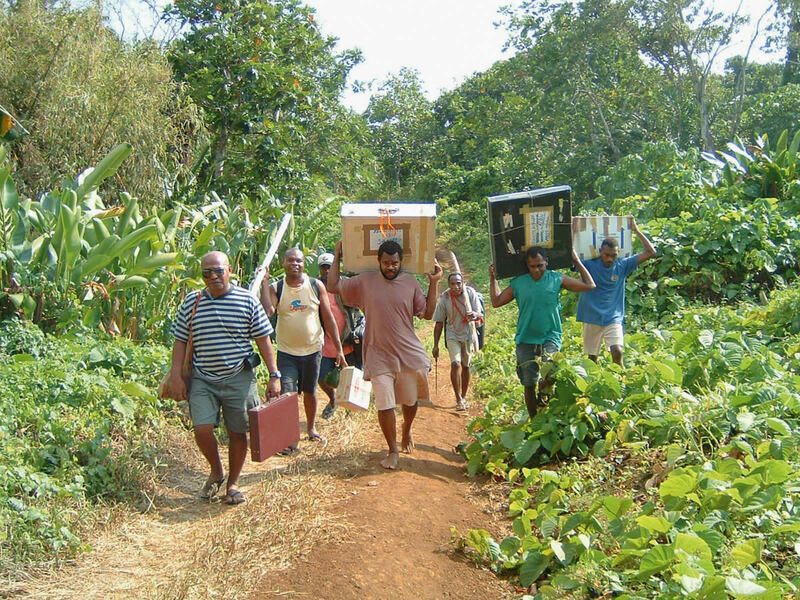 For decades, Vanuatu’s eye care depended entirely on short annual external eye team visits. In 2001 the first national five-year plan was implemented in partnership with The Fred Hollows Foundation (FHF). Since 2001, FHF has been working with the Vanuatu government Ministry of Health (MoH) to establish the country’s first national eye programme. The Vanuatu National Eye Care Programme (VNECP) is based on VISION 2020’s three main pillars: Human Resources Development, Infrastructure and Technology Development, and Disease Control. 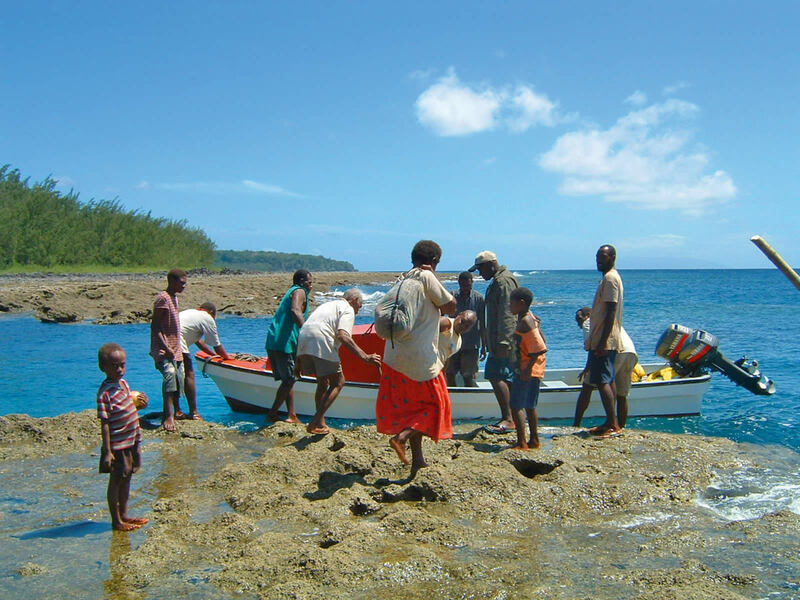 In October 2003, Vanuatu joined the VISION 2020 global initiative when the Declaration of VISION 2020 Support was signed by the Minister of Health together with high government officials and health and other non-governmental eye care providers. In addition to three other small provincial hospital eye clinics, the programme now boasts two well-equipped eye care facilities in the country, strategically situated in the north and the southern regions. An ophthalmologist registrar commenced training in 2003, and eleven eye nurse practitioners have been trained and stationed in the provincial hospitals to coordinate and provide primary eye care services. The eye nurse practitioners form an effective network of mid-level personnel. Last year a total of 14,972 patients were seen, of which 9,756 (65%) were seen by these eye nurse practitioners. Prior to 2001, the Cataract Surgical Rate (CSR) in Vanuatu was on average 250 cataract operations per million population a year. After the first year of the programme, the CSR rose rapidly to 1,260. The CSR increased further to 1,650 in the second year, but slightly decreased to 1,592 in 2003. The CSR further dropped to 1,400 in 2004. This trend most probably indicates the rapidly diminishing cataract backlog; hence our outreach programme is now concentrating on the rural areas, targeting the smaller health centres and the rural communities. Teams are brought closer to the rural communities, delivering secondary eye care such as cataract operations, which were in the past only available in big provincial hospitals. A surgical audit on a portion of the 2001 data, using Hans Limburg’s cataract outcome software (see Useful Resources on page 100), revealed the following postoperative visual outcome at one month: a good outcome of 91%, borderline outcome of 8%, and poor outcome of 1%. Because of the diminishing cataract backlog, the cut-off visual indication for cataract surgery is now 6/36. Apart from the visiting eye surgeons and the training ophthalmology registrars, all cataract operations, since 2003, have been small incision cataract operations. This has reduced the cost of surgery significantly. The other common cause of blindness is trauma. Diabetic retinopathy is emerging with the increasing prevalence of diabetes because of changing lifestyles. A diabetic retinopathy screening programme is in progress and an argon laser is available to treat diabetic retinopathy patients. The World Diabetes Federation is starting a diabetic project focused on reducing the complications of diabetes in Vanuatu. In addition to FHF, there are five NGDOs working with the VNECP and the MoH. The Pacific Islands Project (AusAID-funded) and Surgical Eye Expeditions (SEE) send ophthalmology teams on an annual basis. These partners complement the services provided by the national programme. Their visits have gradually been scaled down during the last three years from three annual visits to only one visit this year. International Centre for Eyecare Education (ICEE) assists with training, and the Presbyterian Church of Vanuatu organises optometrist team visits and has established an optical laboratory. Both MARC Project (Hope Alliance) and Youth Challenge Australia assist the local team with screening and transportation of patients to surgery locations. One of the many barriers is the scattered population coupled with rugged mountainous terrains and vast sea expanses. Transportation costs for both land and sea are high. The land area is 12,000 sq km compared to a sea area of almost 900,000 sq km. Another challenge is the sustainability of the programme, which depends on the commitment of the MoH. Sustaining government support was initially a concern but this is now gradually showing a healthy trend. The staff salaries and the drugs and consumables supply are now taken over completely by the MoH. This is an achievement considering that the MoH allocates to eye care only 0.06% of its health budget, which constitutes 12% of the national budget. The present five-year plan ends in December 2005, so the next VISION 2020 Action Plan needs to be developed.